Evasi0n7 jailbreak tool would no longer work after the latest iOS 7.1 update as we all know. Apple has patched a number of security vulnerabilities used in evasi0n7, hence the latest iOS 7.1 update is not recommended for those who want to keep their iOS device jailbroken. CoolStar @coolstarorg: SemiRestore for iOS 7 will use OpenSSH instead of AFC2 (which was used on 6.x), so make sure you install OpenSSH before 7.1 is out. However, if you are a jailbreaker confused about the risks of latest iOS 7.1 release, here is the best news! Developer of SemiRestore, CoolStar, has just released the updated SemiRestore7 with support for iOS 7. The tool will be helpful when you get into a reboot loop issue because of some tweak. This will restore your iOS device, removing the jailbreak. SemiRestore7 jailbreak tool allows users to restore jailbroken iOS devices to near stock condition without losing the jailbreak. SemiRestore was first released for iOS 6.x and has now been updated for iOS 7. SemiRestore needs OpenSSH which mean you first have to install OpenSSH on your iOS device. Please note to change the root password of your jailbroken device after installing OpenSSH to prevent others from remotely accessing your iOS device. SemiRestore7 for iOS 7 is currently available only for Windows XP SP3 and higher. Mac and Linux versions are being tested. Here is the website to download SemiRestore for iOS 7. 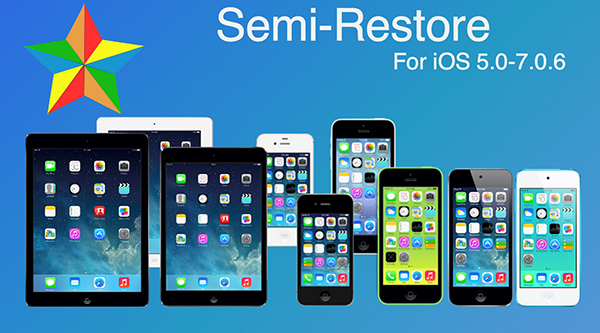 SemiRestore7 is compatible with all jailbroken iPhone, iPad and iPod touch models running iOS 5.0 to iOS 7.0.6.